politico in stilettos : Fendi Field Teams? Grassroots in Gucci? What will Cynthia Nixon’s Campaign Look Like? Fendi Field Teams? Grassroots in Gucci? What will Cynthia Nixon’s Campaign Look Like? 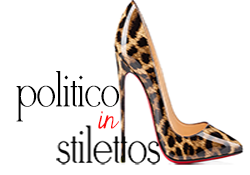 From WV to Washington, D.C., Politico in Stilettos is a blog dedicated to empowering women to put their heels on and get the job done either behind the scenes on political campaigns or as candidates. Professionally, I'm the co-founder and partner of Control Point Group who doesn't know anything put first place, because there is no second place in politics. Personally, I'm a firecracker who has a serious shoe addiction.